Norma Ann Muise was born in 1940 on Surette’s Island, Yarmouth County, Nova Scotia. Her mother was Gertrude (Surette) Muise. Her father, Henry Muise was lost at sea at age 28. Her eighth great-grandfather was Phillip Muis d’Entremont from Pubnico and formerly from Port Royal and married to a Native woman. Norma is the mother of three sons, Henry Hubbard, Bennie Hubbard, and Brad Hubbard. Muise has four grand-children, Jason, Priscilla, Matthew and Heidi Hubbard and one great-grandchild, Faith Hubbard. In 1990, she became founding member of the Yarmouth Town and County Crime Prevention Association, Yarmouth, Nova Scotia. In 1991, she became a Victim’s Assistance Volunteer for the RCMP assisting victims of crime including elderly Acadians who spoke no english and assisted the RCMP in educating the elderly on personal safety. In 1995, she was Director and Founding Member of Kepsp’kwitk Metis Council and formed the Ladies Circle to promote Native Culture to the young people. In 1998, she assisted the RCMP in the Swiss Air Flight 111 disaster in Halifax. She was the only volunteer who was capable of translating and assisting German, Swiss and Dutch family members of the victims who spoke French as a second language. She worked eight years at the Yarmouth Regional Hospital as a personal care worker working with the elderly and the handicapped. Since 1995, she has diligently worked recovering and learning the ways of her Native ancestors. 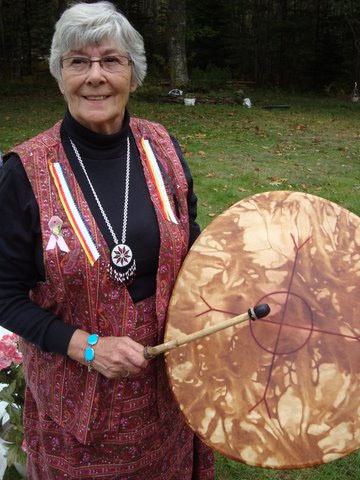 First attending Mi’kmaq Spiritual Gatherings, she realized she had finally found her place on Mother Earth. Since Nativeness is totally based on respect, spirituality is a way of life, not a religion, she respects all others rights and freedoms to practice their spiritual intimacy with the Creator in the way they feel most comfortable with. She was given the responsibility of being Keeper of the Sacred Tobacco seeds which originally had been presented to Elder and Chief of the Acadia First Nation, Charlie Labrador. She grows organic tobacco to distribute to elders for their prayers and ceremonies. Having spent three winters hosting Elder Murray Mooers during the winter months, he taught her many Native crafts such as making birch bark baskets, ash splint baskets, wooden flowers and he gave her the Native Spirit Name “L’il Red Feather”, he also advised her to put a little red feather in all the baskets she produced.